I agree that riders come in all shapes and sizes and bikes do too. My first bike, a Honda Magna was not a good fit for me. My 2nd - a Yamaha V-Star was great. I put many miles on that bike. The Buell Blast? Awesome. Light, short and corners like a sport bike is meant to! A Sport-Touring bike? A bike can be what you make of it. No this is not was most people would think of when the term Sport-Touring is brought up but I love riding this bike so much that I have taken it on two cross country trips; Florida to Michigan last summer, to Maine this past June. I can easily put 500+ mile days on in the saddle and get up the next morning to start over again. Bottom line, if you love YOUR bike, it is the Best Bike! Well, it has been a few years since I purchased that '5 Blast. I put 55,000 miles on it and then purchased a 2009 Blast which today has 39,000 miles on it for a total of 94,000 miles in about 6 years. The '09 is still going strong and I hope to make that 100,000 miles mark then push beyond. Are there bigger bikes out there, yep. Do I need one, nope. As long as I can take off for 2-3 weeks without loading it on a trailer, then I'm a happy rider. I have a 2010 Buell Blast....probably one of the last few that were made. I learned to ride two years ago and I bought it this past January after I dropped my 2006 Suzuki Boulevard M50 for the third time....figured I better take a step back and work on my riding skills. 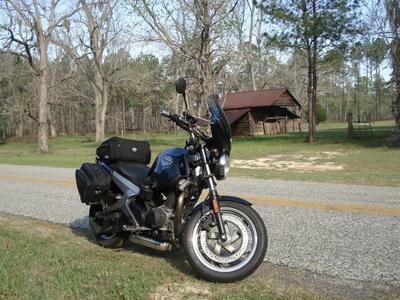 Love my Buell....it is a "blast" to ride around town, very light and handles nicely. I added a custom comfort seat from Sargent Cycle products and a windshield. She puts more miles on her 500cc Blast than most riders with Bigger engines. Maggie has a great philosophy about riding. I hope she continues to have many happy, healthy miles ahead of her (and I am sure her bike will tour as far as she wants it too). Maggie - your 2nd picture was so cute - I had to add it to this page up higher! Thanks so much for your submission! Ride safe!!! Me and Mr. Buell himself! This is my second Buell and 5th bike. I've had a 250 Honda Nighthawk, Suzuki 400 Bandit, Yamaha GSX650, Buell Blast and now my XB9S. 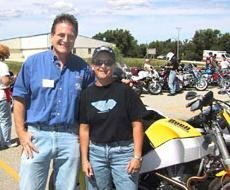 I am a huge fan of Buell for several reasons.....1) I live in WI, 2) My friend has been a personal friend of Eriks since the days of him building bikes in his grandfathers barn 3) Erik is a hell of a nice guy and was nice enough to sign my XB9S! 4) Buells are awesome bikes. Being only 5'0" I couldn't ride any of Eriks first bikes until the Blast, and then the XB9 was short enough to balance on toes. Having riding experience I am comfortable on my toes. I am a 5'0" female also, how did you feel on the yamaha GXS 650? Hi i am thinking to make the transition to a sports bike, i have a shaddow 650 but i am worried and i dont know which will be the best fit for me. Can you please give me some advise? Hi there, my name is Shotgunshell i'm a hangaround with the She Devils M/C Bay Area. I ride a 2000 Buell lightning x1. Best way to describe this bike is a Harley Davidson on steroids. I was 6 years old when i started riding my grandmas honda trail 50 i couldnt touch the ground so someone would have to ride with me to hold up the bike when i stopped. Riding is an addiction for me, i will ride til the day i die. 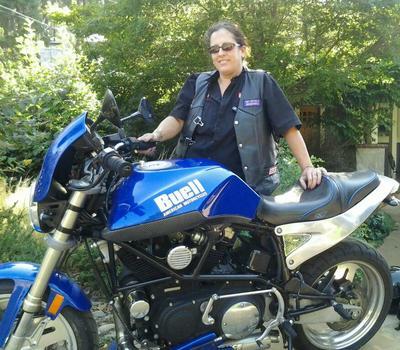 I have what is most important to me my daughter (17) and my bike, I am a woman and I RIDE!!! I've had my X1 for 4 1/2 years. It's been very reliable, nothing has gone wrong thatI couldn't fix myself. I've put higher bars on it for more comfort and control, screaming eagle air intake, race-kit ECU and custom paint job. It goes really well. I live in New Zealand, and the bike seems to have been made specifically for the roads around here. I have no plans to get another bike. I've been riding bikes for 30 something years and I wish my earlier bikes had been this good. If these had been around in the 80's, everyone wouldve had one. Lucky us! I love the way the Buells sound. Must be blast to ride too!